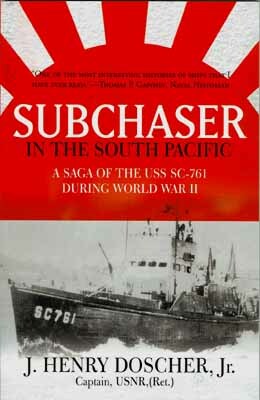 “SUBCHASER” In The South Pacific. A Saga Of The USS SC-761 During World War II. By Captain J. Henry Doscher, Jr., USNR (Ret.). The USS SC-761 was part of the American “Splinter Fleet”—small warships made of wood ordered to sail into harms way against the superior Japanese vessels made of steel. The vessel began it naval career in 1942 performing convoy duty guarding against German U-boats along the Atlantic coast from New York to Cape May. However, America’s critical needs in the Pacific caused the SC-761 and other selected subchaser’s to be reassigned to the warmer waters of the South Pacific Fleet in January 1943. SC-761 reported for duty in the South Pacific in April 1943 and promptly went to war against the enemy. The smallest warships in the US Navy, the SC-class vessels were tasked with some of the most dangerous missions in the war. The wooden ship fought-off attacks from Japanese aircraft, protecting convoys from submarine attack and survived the fury of Pacific hurricanes. SC-761 rescued coast watchers in islands deep behind Japanese lines. They fought in the bloody campaign to capture Guadalcanal and sailed repeatedly up and down the deadly Ironbottom Sound rescuing downed airmen. It is an incredible story of one of America’s most gallant and unsung ships. New Softbound book. 110 pages, 31 black and white photos, crew roster, appendix and index.